Augustus Agamemnon wrote: I have to admit there aren't many Korean books that show complex designs). There are couple of reasons for this but mainly it's because of the cost..
You see, here in Korea, Origami is not that popular among the various generations and there are still biased views over origami as 'kid-things'. So we mainly sell the books with easy designs aimed at children consumers(majority in number). Otherwise, if we make books with complex models aiming at mania class(minority in number), we may fail to sell the books and have a deficit.. If you guys are supportive and have intentions to buy the books, we can make.. If the book features nice complex models, there surely is a market. The complicated thing is to get in touch with those interested. I guess a collaboration with Nicolas Terry would be good, because he has the right customers. Of course you can advertise the book here as well as on the Origami Mailing List and there are also a couple of other Origami Forums out there. I'd definitely like to buy a book of you complex designs. I would definitely Buy a book of complex models. A plus side would be if it was relatively easy to purchase, sometimes I find purchasing from foreign sites can be a bit hard due to language barriers and such. I have the idea to make a book with Korean artists since my Korean Convention trip a few years ago. Then I evoked the idea with Jassu . Now, to move ahead, I need to find a korean guy who know all the koeran artists and accept to be the link between them and me during the conception of the book. greencube07, if you want to be that guy, contact me ! TERRY Nicolas wrote: I have the idea to make a book with Korean artists since my Korean Convention trip a few years ago. Then I evoked the idea with Jassu . Now, to move ahead, I need to find a korean guy who know all the koeran artists and accept to be the link between them and me during the conception of the book. greencube07, if you want to be that guy, contact me ! It seems that the models of my own were all rejected (for diagraming) by your decision, and was also rejected by the official Korean Origami Group, so I have no right to participate in the interaction. (This is the main reason why we are making the book on our own : we can't access and ask for your help when you're dealing with the official group members.) Otherwise, I would have helped the whole process..
AxolotlBottle wrote: I would definitely Buy a book of complex models. A plus side would be if it was relatively easy to purchase, sometimes I find purchasing from foreign sites can be a bit hard due to language barriers and such. We were thinking about asking Mr.Terry for selling the books through his site(origamishop; which is one of most easiest ways to buy origami stuff), but we couldn't since the models were all rejected even before the ask.. so we're thinking of selling the books through Amazon and OrigamiUSA(if they accept them). I cannot remember that I rejected any book ! I try usualy to support any publication, even a confidential, buying at least a minimum quantity order to help the author. Just check origami-shop and you will see so many books in this way (last was Hsi-Min's book for example) . Maybe I forgot but honestly, I'm very surprise about your story. I've requested several korean models for Drawing Origami Tome 2 and choose 2 (because can't add more in one book). This is what you are talking about ? By the way, I feel you slightly embittered so I invite you to contact me privately so that we could solve this problem and eventually see if and how I can help for your project. zachb wrote: What about a book by Alexander Kurth? It can give some helpful tips with wet folding, as well as reverse engineering like what he did with Joisel's work. 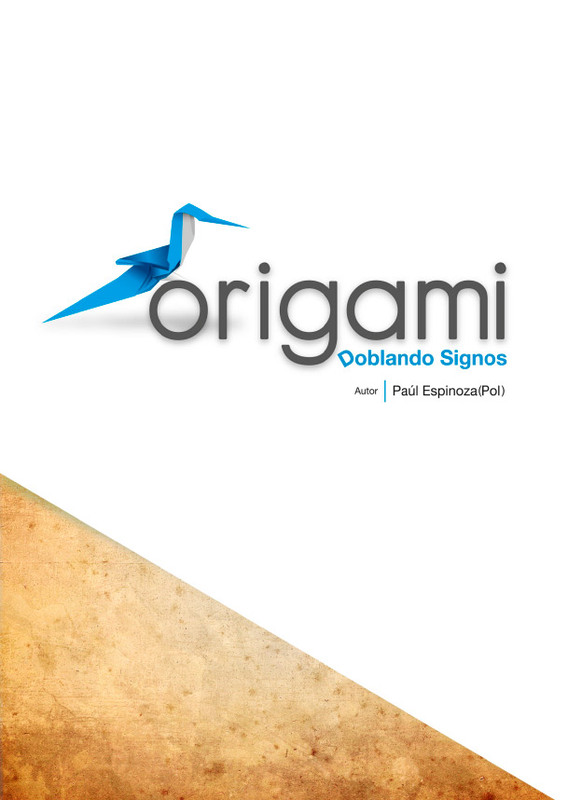 Here I leave a link of an Ecuadorian origamist, I met him at an origami convention in Cusco, he is a very good person and if we are Latin, we must support ourselves, so support the Latin talent. Last edited by pol origami on November 27th, 2016, 3:16 pm, edited 1 time in total. I want a book by... Joseph Hwang. First, I also would really like to see a book by Hojyo Takashi, since I really enjoy his mythologic characters. Second, a book with Hubert Villeneuve's works would be great, his way turning box-pleated bases into statues full of life and personality astonishes me. Third, I'd love a book by Sébastien Limet, too. Finally, I am missing complex origami books in Germany. In Germany most people recognize origami as childish stuff, and so publications strongly orientate on children. I know there are some great German designers, so a collection of complex models by German designers is definitely on my list of books that I'd buy if they were there. ha! this book has apparently been in the works for decades now. MotherOfThree wrote: Apart from that, I'm missing a book about polygon packing design theory. Robert J Lang's ODS has a chapter on polygon packing, but only in the second edition. bethnor wrote: ha! this book has apparently been in the works for decades now. I know, but you can always hope! NeverCeaseToCrease wrote: Robert J Lang's ODS has a chapter on polygon packing, but only in the second edition. Robert Lang's chapter is really interesting, but I was talking about something that goes far more into detail. He explains box pleating and hex pleating, but "School of Masters" is almost completely about polygon packing including more complex techniques. Don't get me wrong, ODS is the best book on designing you can find, but Andrey Ermakov is a true master on polygon packing, and so his book goes deeper (and that's what I am thinking by only looking at the graphics). On the other hand, "School of Masters" seems to have not much explanation about level shifting, pythagorean stretches and other stuff like that. So my (perhaps utopian) dream is about a book that handles everything, optimally in english. This topic isn't called "I want a book that is going to exist by...", so as mentioned above, you can always hope.